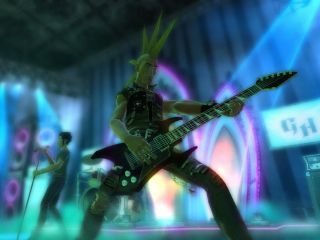 While we were fully aware that the next iteration of Guitar Hero – sure to land sometime later in 2010 – would have Project Natal integration, the founder of the massively popular gaming franchise has let slip a few more details on how this is going to work in the games. The development team over at Neversoft are already looking into the best ways of working in camera and motion-sensing technology into their game, as was (more than heavily) hinted at in our earlier interview of Guitar Hero CEO Dan Rosensweig last month. "There are a lot of possibilities that technologies like Natal will bring, and we're definitely exploring those," GH founder Kai Huang told The Seattle Times. "We haven't made any specific announcements of what we're doing with new technologies in 'Guitar Hero 6' and beyond, but one of the areas we're exploring certainly is camera technology and what you can do — track your movements and maybe have your characters on the screen do certain things you're doing, or personalise it more so it can look more like you on stage rather than just be an avatar." So there you go, both the founder of the series and the new CEO have both gone on record to state that Natal motion-sensing control WILL be integrated into the next Guitar Hero. That sounds pretty much like a 'specific' and fairly official announcement to us… Right now, we're off to play with our Whammy Bar, while we still know what it feels like!